In the foreground: Aaron Hill reads his poem Wednesday that was written from the perspective of an iPod. In the background, from left, Trisha King, Shannon Hill, Shirley Simpson and Terry Carwile listen. This was the first time most of them read poetry in front of an audience that wasn’t their classroom. But, the winners of the Carol Jacobson Memorial Poetry Contest — a writing competition for Craig Middle School (CMS) eighth graders — paced themselves, enunciated, hit the right cadence and proudly presented their own poems Wednesday night. Nature was a moving subject to Neece, so in her poem she described a fall breeze with pointed metaphors and rich imagery. 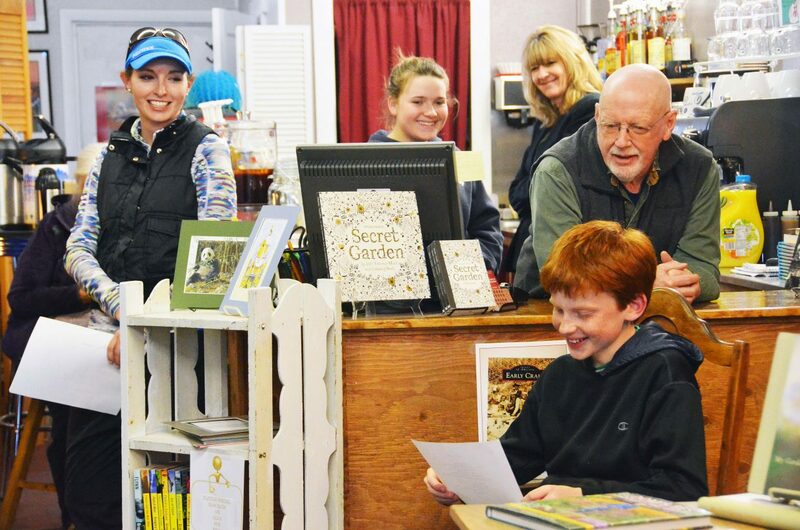 This is the eighth year CMS, Downtown Books and the Northwest Colorado Chapter of Parrotheads partnered for the contest that memorializes the late Jacobson’s legacy of poetry and creative work in Craig. The Parrotheads provided cash prizes for the top three winners. David Morris, member of the Craig Poetry Group, who launched the poetry competition with Jacobson, handed the runners-up each a new book. The students read their poems and accepted their prizes in front of an audience of about 40 listeners, crowded in between the bookshelves and tables at Downtown Books. The students worked a full month on the poetry competition, and King said that work paid off. She directed them to write about something they cared about deeply. Terry Carwile, Craig Mayor and owner of the bookstore, was pleased with the reading that memorialized Jacobson, who was his wife. The work the students put into their poetry was heartwarming, Carwile said. Generators rumble to life on a chilly April morning. Bright eye stare, stamp in defiance. Sheep lose the silent battle of wills. An angry next of mechanical bees. When the dogs misbehave or when their hearing is selective. Our stomachs are running on empty. And pork and beans, make our mouths water. The generators wheeze to life again. Shorn sheep, shoot toward the sage hills. Feel mud devouring my feet. Carries me deeper into the unexplored. The men throw their nets. Hundreds of shrimp struggle to free themselves. Every throw of the net cuts a part of the sea away. As the buckets fill, the spirits of the men thicken. Frightened fish dash past my feet. Chum slash through the water as if to escape death.